I’m now back in Australia, but I still have three cities from my US tour to share about! After leaving Orlando, I spent a week on the west coast of the US, beginning with Seattle, Washington. I’m pretty sure I’d never been to Washington (state) before this and I had a lovely time. It was an amazing whirlwind of visiting with friends from all my years in Beijing. Seattle is a seaport city in the northwest of the US, close to the Canadian border. Seattle is even more water-filled than my previous two stops. The city is on a narrow isthmus between Lake Washington and Puget Sound (an inlet of the Pacific Ocean). My experience began in the air, with a 5+ hour cross-country flight. After two hours I began to see snow on the ground, light enough that lines of crops in the fields were obvious. Half an hour later the snow became thicker, softening peaks and covering all but the steepest of slopes, then all but sheer cliffs. As we travelled west the land became more hilly until we hit a big mountain range, with stands of snow-dusted firs and swaths of pristine snow. This beautiful view disappeared beneath cloud cover, but sharp, snowy crags pierced the clouds in a few places. We descended toward Seattle and suddenly all I could see was GREEN – the deep green of well watered pine trees thickly covering the hills below. At the airport I smiled to hear announcements first in English, followed by Mandarin. A little thing, but it made me feel at home. I was met by a young woman I mentored for five years in Beijing. We went to a popular local cafe and shared a “northwestern omelette” – a genius concoction of eggs with salmon and cream cheese. The yumminess of the meal made up for an unfortunate incident outside. While standing on the street waiting for a table the topic of birds came up, my friend explaining that there are “cravens” about – a crow-raven mix that are very big. Some were sitting on the wires high above our heads, and I had the idle thought that perhaps standing under a bunch of big birds might be unwise – but I was too busy chatting to bother moving. Big mistake. One of the stupid things splattered its mess right on my jacket and shirt! 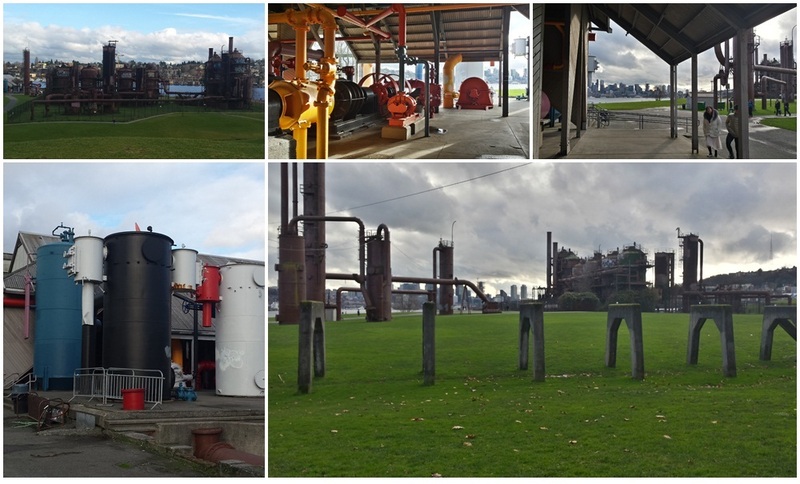 After eating we visited Gas Works Park. This 20 acre park is located on the shore of Lake Union, with amazing views of the city skyline across the lake. It was the site of the Seattle Gas Light Company’s gas plant, which closed in 1956 after 50 years of operation. The park retains the plant’s superstructure – a visually and historically interesting element, being the only remaining coal gasification plant in the US. Some pieces are left as fenced off ruins while others, painted in bright colours, are accessible. There is also a created hill (made of construction rubble covered with soil) with a beautiful sundial on the top. I loved the city views, the interesting elements of the gas plant, and even got to watch a sea plane take off right in front of us. That night I stayed with her and her husband (who I also knew in China). It was amazing to spend time with them; I was full of joy and jiejie pride, seeing their life together coming together in great ways. The next day they helpfully chauffered me around downtown to see more friends. First we saw another of my Beijing kids (who I last saw in Singapore) and his fiancée (and sister of a friend I visited in Minneapolis). We met at a hipstery cafe/coffee roasting place – seemed appropriate for Seattle! It was so fun to sit around the table with these four young people, sharing about the different things we’re doing and just being with them all. It made my heart very happy. Next we went to the Seattle Centre, where I got a good view of the Seattle Needle. Inside, I met up with a couple I knew during my first year in Beijing. We were in a small group together and I spent a lot of time (including my first Christmas in China) at their adjoining apartments – this being before they were a couple, let alone married 8 years and parents to a gorgeous toddler. I hadn’t seen them in about 10 years – and yet it felt so natural to sit and chat and share about what we’re all up to now. Space Needle and fountain at the Seattle Center. Next I was picked up with Beijing friends the Beemans. They were a big part of my Beijing life during the three years they lived there. I particularly loved playing cards and other games with them – and we got in several hours of cards (three different games, two of them new to me) during my all too brief stay with them. They live on the Sammamish Plateau, east of Seattle – with lots of woods and lakes in the area. They tell me that in Spring they regularly see deer in their backyard – does with tiny fawns, curling up to sleep and springing around in circles. Amazing! The next morning another Beijing friend picked me up; we’d only been on the move a minute or two when we came across deer in our path. 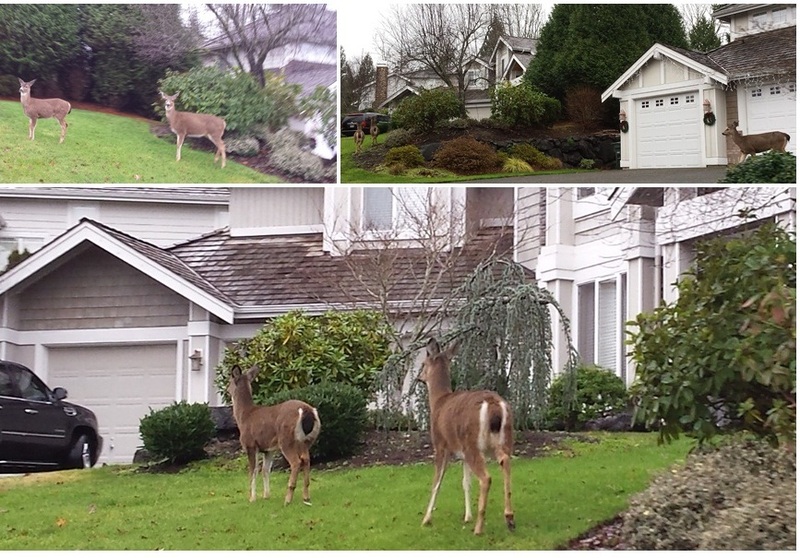 There were a few of them casually sauntering across the road, driveways, and front yards. Lynn drove me back into Seattle to have lunch with one of her sons, who had been in my youth group in Beijing, and whom I had last seen in Singapore. We ate really good food in a tiny Thai restaurant, then walked down the road to a cafe. As a visitor I was permitted an umbrella for the heavy drizzle – something a self-respecting Seattle-ite apparently wouldn’t carry! After a short visit to Lynn’s home in Issaquah (seeing most of the rest of her family) it was time to go to the airport and head to my next destination – San Francisco.